The bus from Phnom Penh to Ho Chi Minh City (formerly Saigon) takes about 6 hours. We travelled again with Giant Ibis which definitely is the comfiest of Asian bus charters. Our one piece of advice though – don’t drink too much during the journey… the roadside ‘service stations’ are not for the faint hearted…. We had booked ourselves into our own little apartment which was only a short drive from the bus stop in the city. Annoyingly we fell into a taxi driver scam and ended up paying £30 for a journey that should have cost about £3 – we were so annoyed! It just goes to show, when you go to a new country with a new currency make sure you know the conversion rate. Vietnamese Dong are in the 100,000s so it takes a little while to get used to. After being scammed out of £30 (which is a fortune in Vietnam!) we certainly wouldn’t be making that mistake again! We got all checked into our apartment – our bedroom had lovely views out across the city. We, of course, couldn’t resist having a fashion show with the Vietnamese conical hat that we found in the living room! That evening, just as Catriona and I were about to head out, we bumped into a couple from Helsinki (Julius and Laura), who were headed out at the same time. Catriona and I explained that we were going to check out a rooftop bar which apparently gave great views out across the city. Julius and Laura asked if they could join us which of course we said yes! After heading back down to ground level we popped back into the main area of the town for a quick dinner before heading back to the apartment for a fantastic night sleep. The next morning we woke up to find our gorgeous breakfast all laid out for us on the kitchen table which we swiftly took back and ate in bed before heading out for the day. We wandered through the town before stopping off for a coffee and a people watch. Just as we sat down the heavens absolutely opened so we thanked our lucky stars that we had secured shelter! 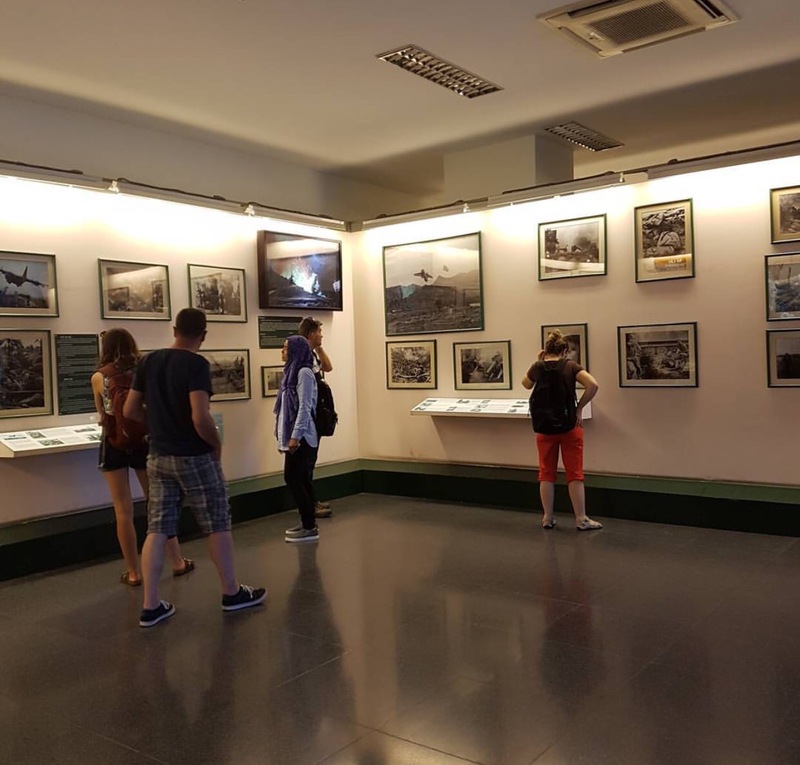 Once the rain stopped we made our way over to our activity for the day – The War Remnants Museum. Me and Catriona were both obviously aware of the Vietnam war, however couldn’t profess to know the what’s and whys. We therefore decided to spend the morning learning about this devastating historical event. The museum gives you an interesting over view of what started the war and what happened as a result. There’s also a huge photography exhibition which is extremely harrowing in places but we felt it was very important to see. 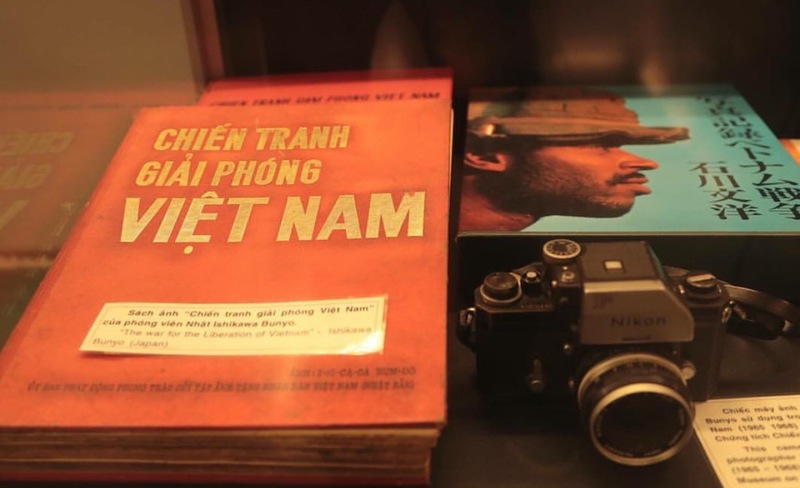 The most shocking exhibit in my view was with regard to Agent Orange. During the war the U.S. Army began spraying millions of gallons of the toxic defoliant known as Agent Orange over large swaths of southern Vietnam. In addition to the massive environmental impact of the U.S. defoliation program in Vietnam, that nation has reported that some 400,000 people were killed or maimed as a result of exposure to Agent Orange. In addition, Vietnam claims half a million children have been born with serious birth defects, while as many 2 million people are suffering from cancer or other illness caused by Agent Orange. The effect of Agent Orange is still being felt, and is still visible today, almost 60 years later. It really was shocking. 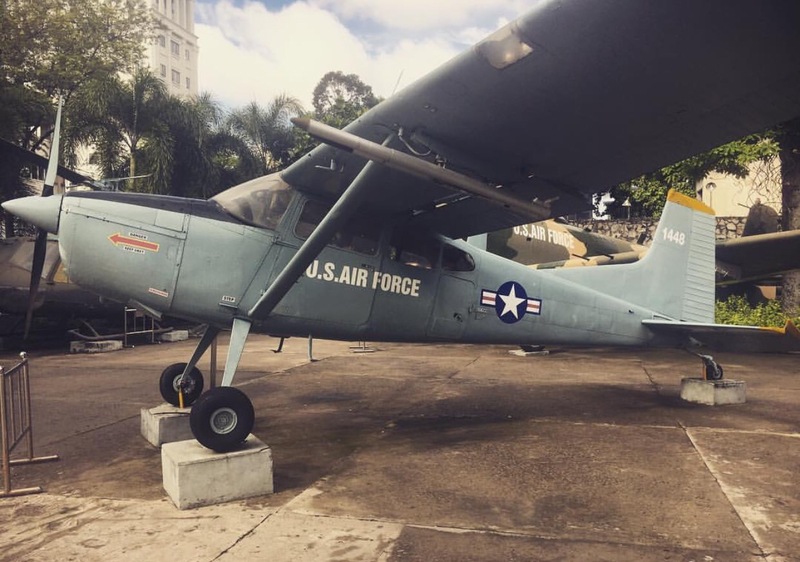 After exploring the museum’s exhibits, we wandered around the outside forecourts where there’s an impressive collection of military vehicles and weaponry. There are fighter jets, tanks, planes, rockets, bomb shells and hundreds of types of guns with supporting ammunition. 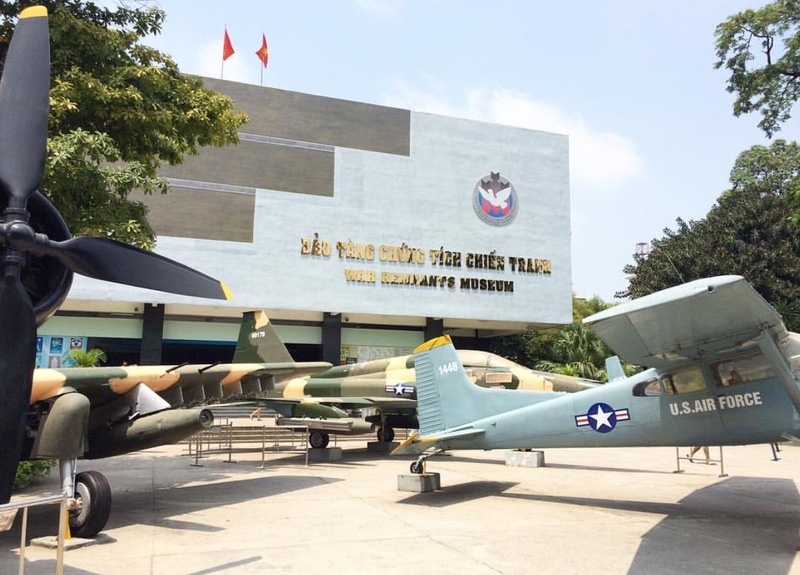 It was a pretty harrowing visit to the museum however Catriona and I were definitely pleased that we had taken the time to learn about the Vietnam war and we would definitely recommend a trip here to people visiting the city! That afternoon we wandered around the rest of the city taking in the sites. We sat out in one of the parks for a quick drink and couldn’t believe the amount of people glued to their phones playing Pokémon – it was mental! 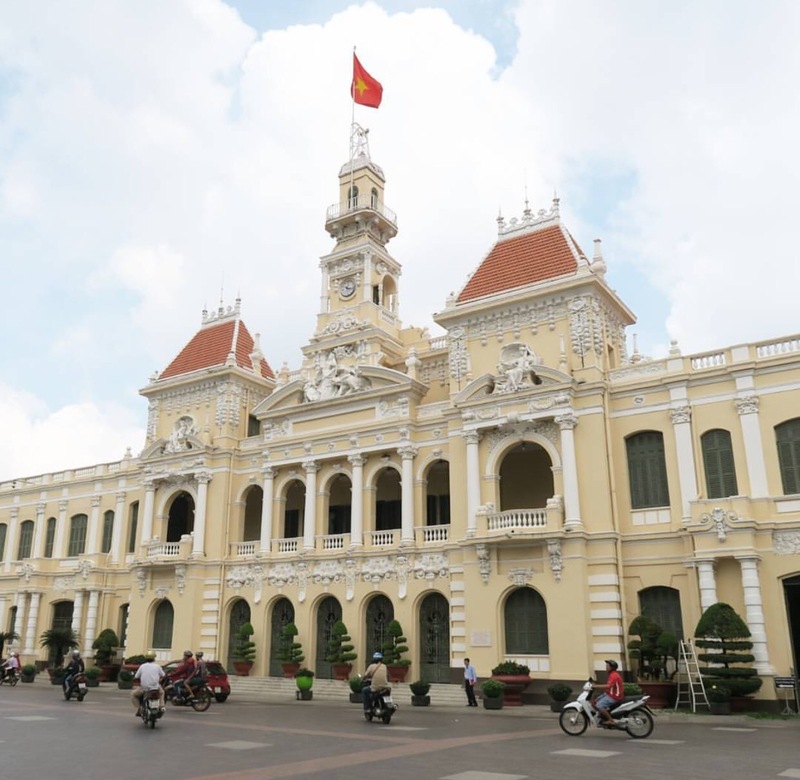 Ho Chi Minh City’s architecture is a fusion of American, French and Chinese influence. 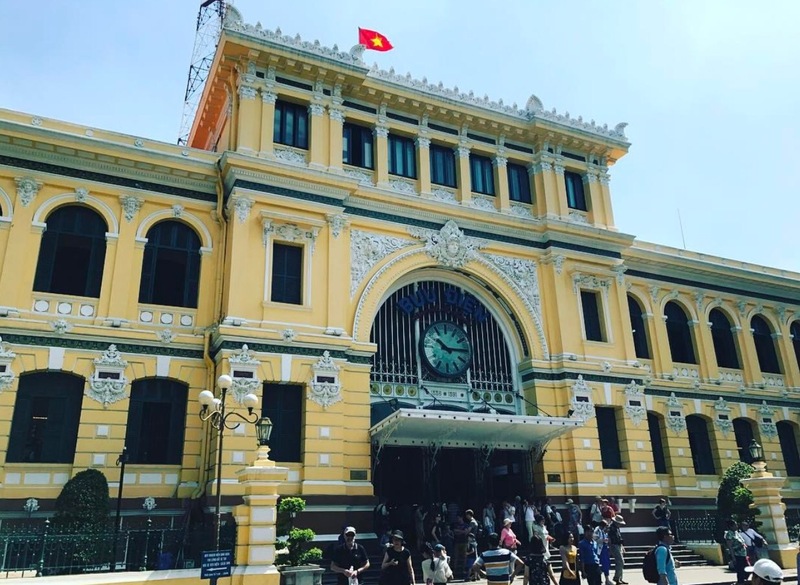 A few notable sights we visited were the City Post-Office, Notre Dame Church and Ben Thanh Market. After wandering for a while we had to have a little stop off and try our very first Vietnamese Bánh mì (a Vietnamese French bread sandwich) – delicious! That evening, after showers etc back at the apartment, Catriona and I decided we would hit the Pham Ngu Lao district. This really is the backerpackers district of the city and is full to the brim with bars restaurants and night clubs. We decided to start off with a couple of cocktails before both ordering the traditional Vietnamese noodle soup – Phở (pronounced ‘fuh’) – delicious! 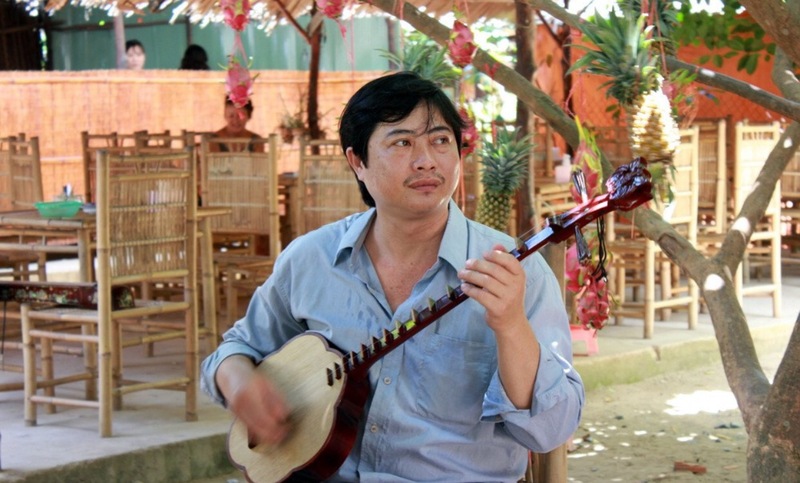 Whilst researching Ho Chi Minh City, Catriona and I had found out that it’s one of the best places in South East Asia to do Karaoke – we were sold! We moved further up along the street and took advantage of happy hour (definitely dutch courage) before flagging down a taxi and asking them to take us to one of the karaoke bars we had seen recommended online. The taxi driver dropped us off outside a huge big flashy karaoke bar quite close to the centre of town. This was nothing like the karaoke bars we get back at home –this place was swish – seriously posh! We headed inside to find out that they were completely booked out – gutted! We realised the errors of our ways, we definitely should have prebooked. We headed back to the street and flagged down another taxi ‘karaoke?’ we said to him, thinking he would take us a little further down the road to the nearest establishment. Ermmm wrong. Maybe 20 minutes later, and now definitely out of the centre of the city, we were driven through a set of winding alley ways and into a shady looking car park. ‘This is it’ I thought. However, just before we both convinced ourselves that the end was nye, there it was – the bright flashing ‘karaoke’ sign. Ok, so this place was definitely nowhere near the league of glitzy karaoke bar we first visited. In fact, Catriona and I are still convinced that it was a brothel. The song menus were sticky, the beers cheap, and no English music anymore more recent than 1993, however Cat and I had THE MOST fun evening singing our little hearts out – mostly to Rod Stewart – mum would be proud. Hours later (!) we managed to get home safely – we survived the night in the dodgy karaoke bar. So so funny! The next morning Cat and I woke up super early as we had booked a day trip to visit the Mekong delta. It’s safe to say we were both feeling horrendous after the night before. Our breakfast looked lovely but neither of us could stomach it… We made our way outside where we were picked up by our tour guides. We proceeded to sleep the entire 4 hour journey down to the river… awful. 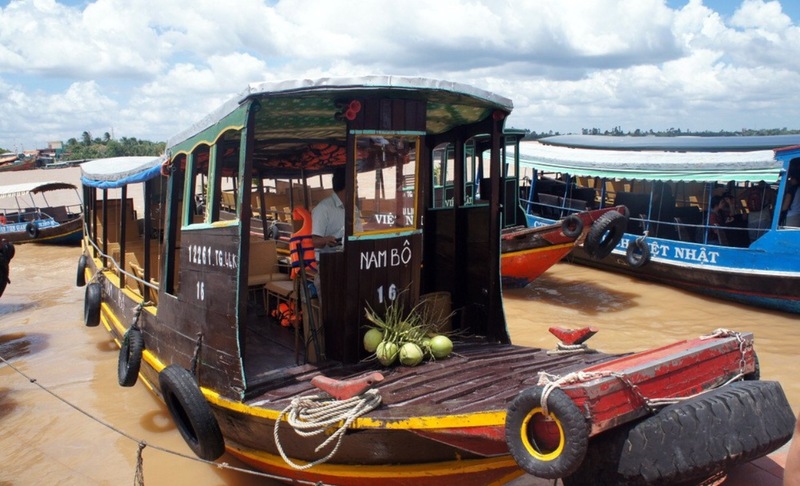 Once we arrived at the riverside, us and our group were swiftly loaded onto a little boat for a scenic cruise down the Mekong River. 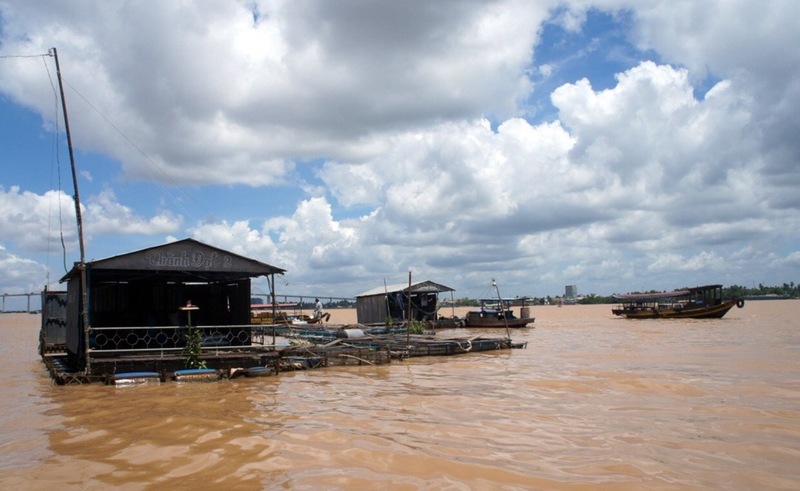 The Mekong is the longest river in Southeast Asia and the 12th longest on earth. 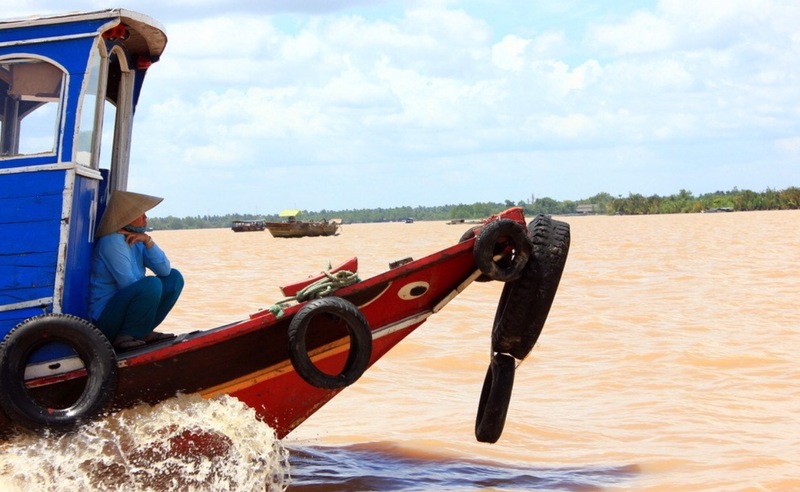 The Mekong journeys over 2700 miles from the Tibetan Plateau to the southeast, through Laos and Thailand to the equatorial flood plains of Cambodia and Vietnam, then finally into the South China Sea. It was pretty fascinating to be floating down this impressive river. The boat soon moored up at the river bank and we were all unloaded for our first stop off; a bee farm! We were shown how the bees were kept before being sat down and treated to some samples of honey tea and fruit. It really was delicious if you could get over the fact that there were bees CONSTANTLY flying around and landing on you. I guess that’s not too surprising seeing as we were in a bee farm… It was pretty interesting though! 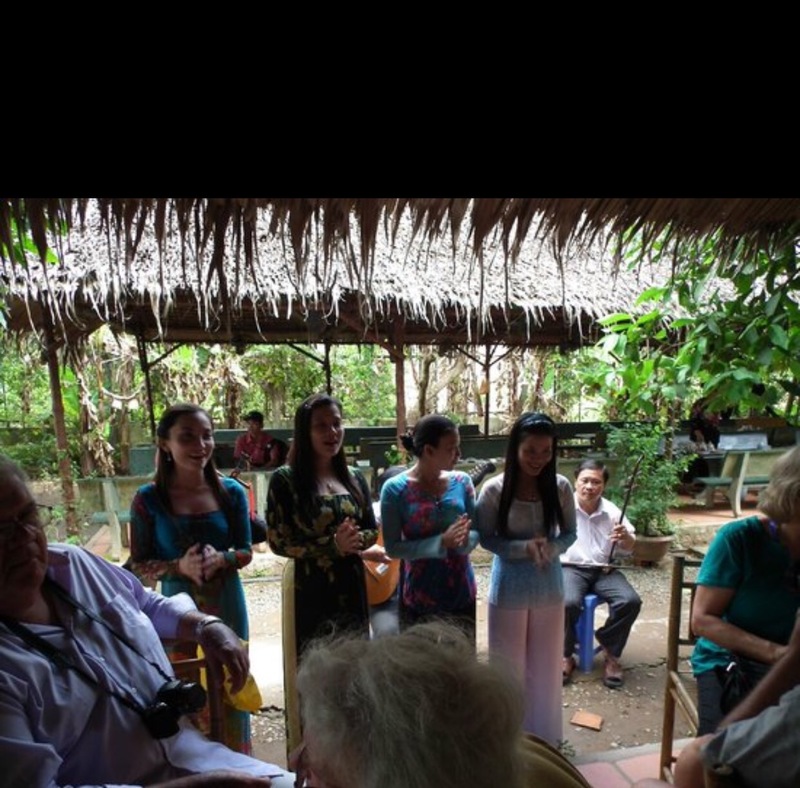 After tasting the variety of honey products we were all hearded through the village to a little dock right on the Tien River. From here we, in fours, loaded onto the little paddle boats where we were taken on a little trip downstream by our oarsman. This part of the trip was pretty nice and relaxing, however the river was so chocablock with boats that the tranquillity was often disrupted with a crash between the boat next to you! It was pretty amazing though, some of the rowers were little old women – I think I would have been exhausted after a couple of minutes but they completely powered through! After the boat ride, we walked a few minutes to get to a small local village where we observed locals made sweets and coconut based products. 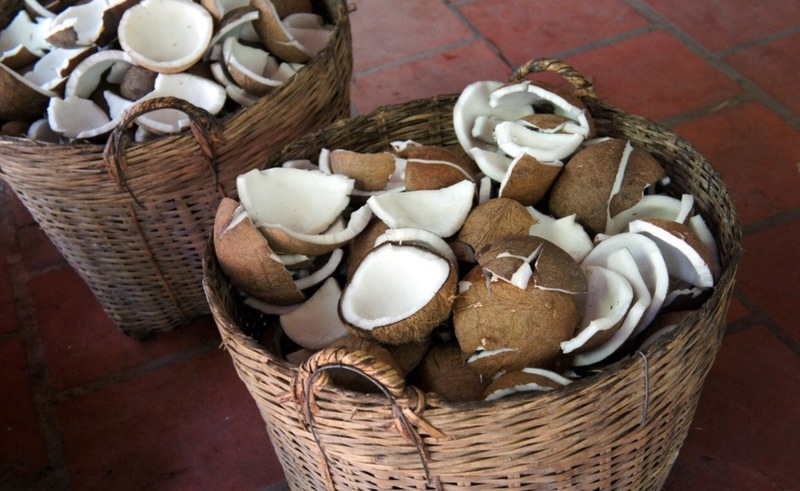 The Mekong Delta is famous for its fresh coconuts growing all year long. Apart from eating coconut meat and drinking coconut water locals make a lot of products using this nutritious fruit such as wines, candies, chocolate using various machines. We watched the ladies making the little coconut candies. It all looks so easy but it’s not. 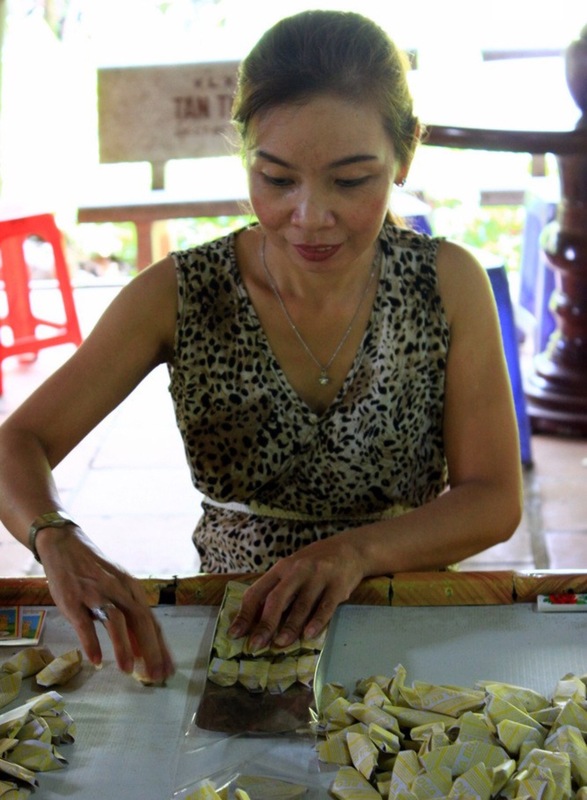 These ladies work very hard doing one thing during the whole day- kneading, wrapping and packing coconut candies. We were dropped off on Pheonix Island which literally was our idea of HELL. This desolate, crumbling and dirty island was home to a delapitated hotel and he most hellish of grounds – this was sold to us as ‘tropical gardens!’ I can’t even tell you how foul it was. We were so miserable and so upset that we really didn’t take many photos here – worse still we were ere for three hours! We were given ‘lunch’ which was the tiniest piece of tofu and dry rice before being told to explore the island. Honestly I don’t think I’ve ever seen so many miserable people – this island was hellish. 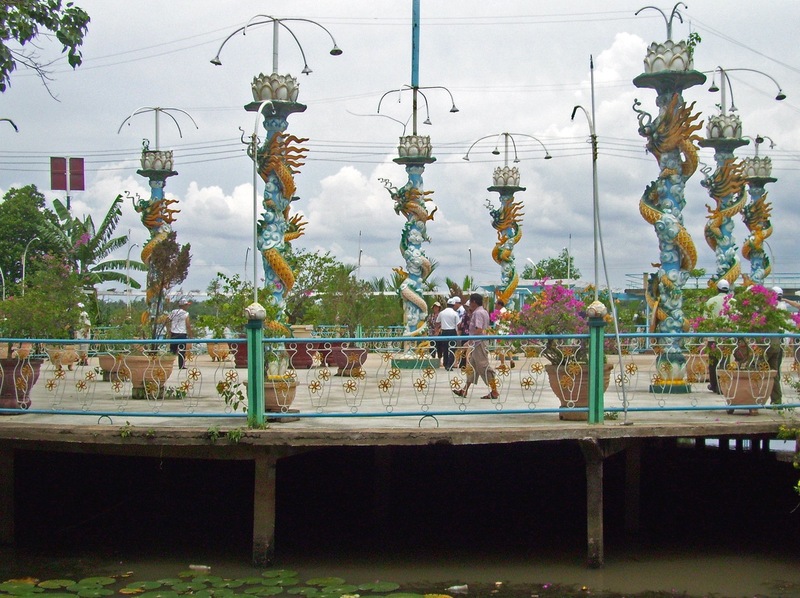 Cat and I did try and make the best out of a bad situation, we walked around the ‘pagoda garden’ and admired the sculptures with their paint flaking off… we drew the line however when we arrived at the crocodile farm. 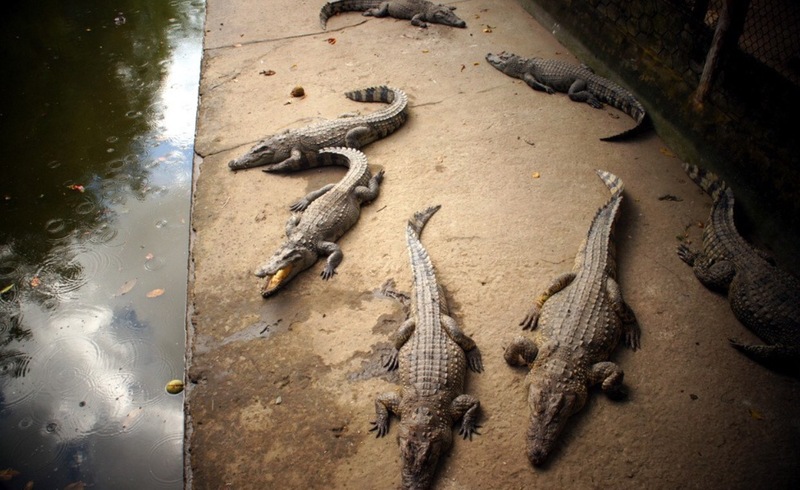 That’s right, the crocodile farm. For a small fee. Tourists could purchase a piece of meat which was hung from a fishing line. We were actively encouraged to ‘tease’ the crocodiles by resting the meat on their heads to make them become aggressive to grab the meat. It was hellish and cruel and Cat and I just hated it. In the end we both bought an ice cream and sat out in the sun praying that the three hours would go quickly. Eventually we loaded back onto the bus and pretty slept the entire way. Everyone on the boat was pretty miserable and felt like we had been conned into an awful day trip. 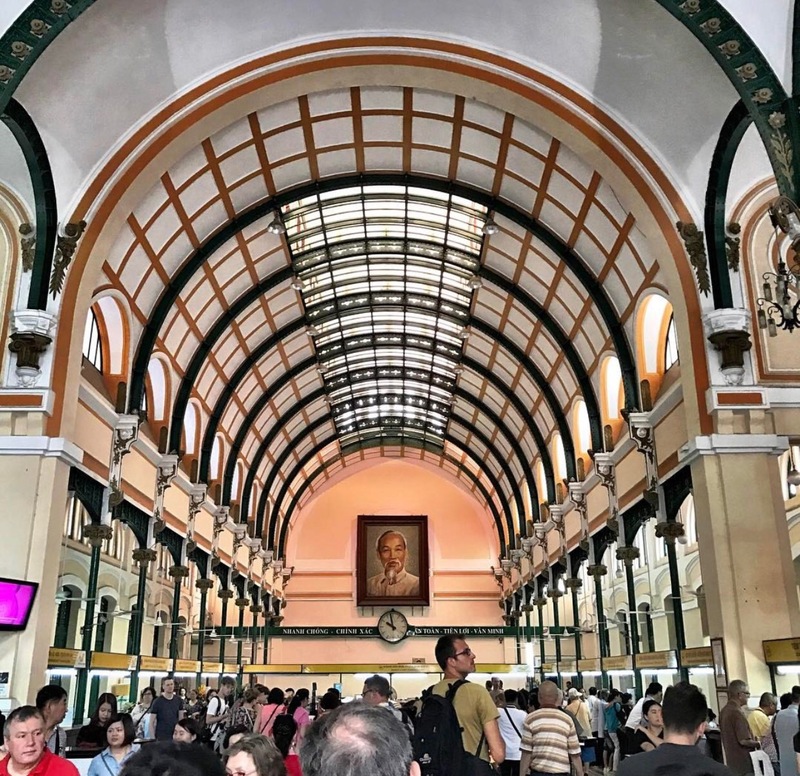 After a couple of hours on the bus we arrived back into Ho Chi Minh City. Cat and I drowned our sorrows with food and grabbed a quick KFC (?!) before having a night in the apartment with pizza, sweets and Netflix. 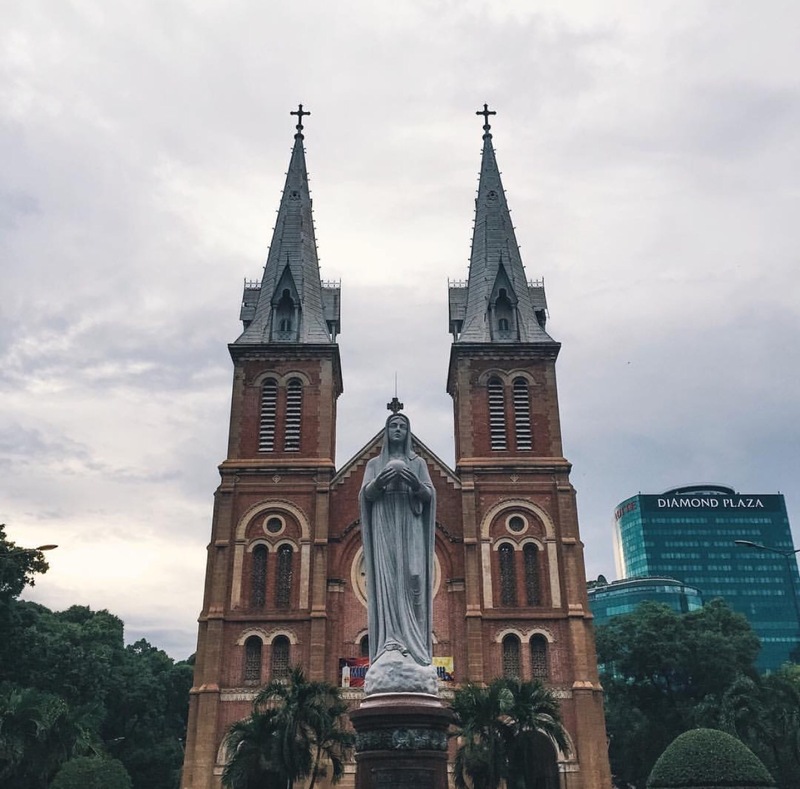 Ho Chi Minh City is a really interesting place and we’ve heard so many people say they absolutely loved it. This certainly wasn’t the experience that me and Cat had – we really couldn’t wait to leave the city. I think we had been pretty unlucky. Our time in the city started with us being royally scammed by the taxi driver and ended with the day trip from hell… it really was a shame. 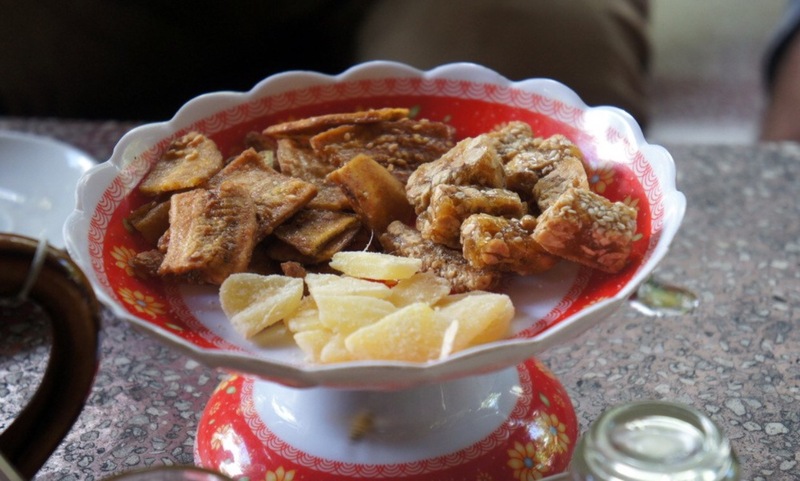 The next morning we were boarding a plane and heading to our next stop – here we come Hoi An! 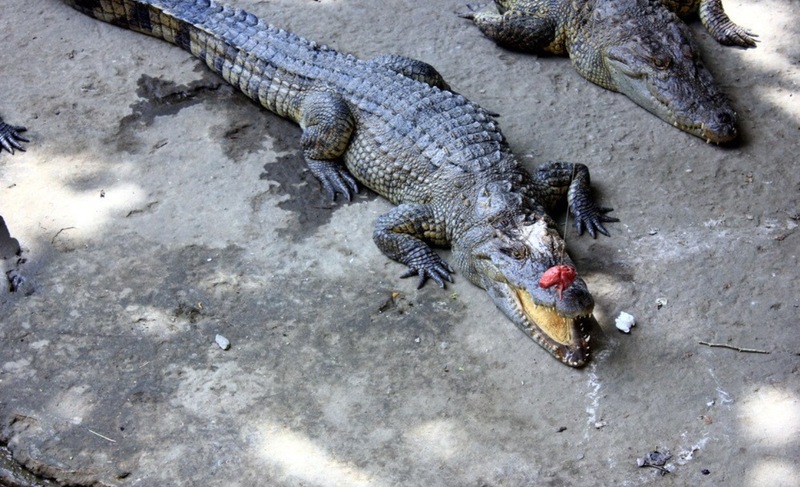 That’s too bad it turned out like that… I can’t believe people do that to those poor crocodiles! The food, however, looks insanely good.